Sift the flour and salt. Grate the frozen butter into the flour. (If it gets sticky, dip it into the flour). Use a knife to distribute the butter through the flour. Add a little icy water and continue to form the dough into a ball, using your (warm!) hands only at the end. Add a little more water if necessary to make it smooth. Wrap in clingfilm and chill for at least an hour. Roll the dough out into a large disc (about 25-30cm) and place on a sheet of greaseproof paper on a baking tray. 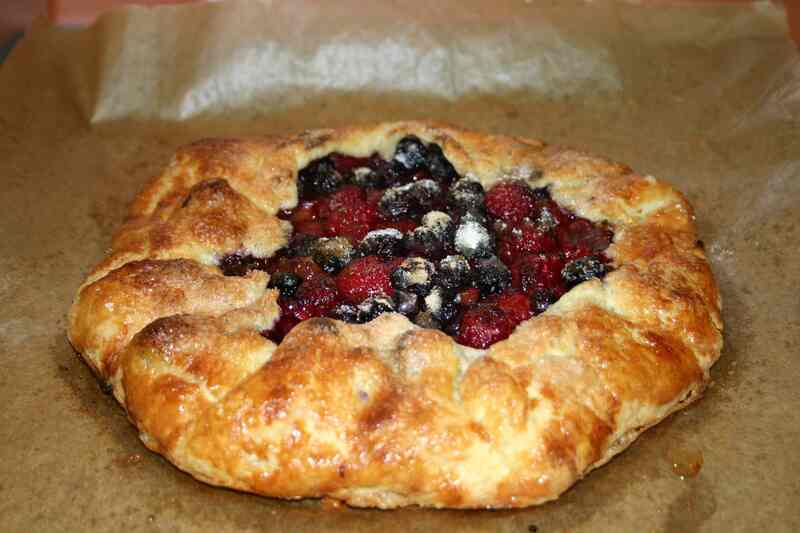 Coat the fruit with the cornflour and spread over the pastry, leaving the edges free. Brush the edges with egg, sprinkle the cardamom over the fruit, and fold the pastry edges over the filling. Now brush the pastry top with almond milk, and sprinkle the sugar over the whole pie. Bake for 35-40 minutes, until golden brown, with the fruit bubbling. Serve with vegan cream or crème fraîche or vegan vanilla ice cream! This entry was posted in Food, Herbs & Spices, Recipes and tagged Food, Postaday, Recipes, Spices, Summer. Bookmark the permalink. But I’m saving your great baking recipes for when it gets cold. Many thanks. PS… Here we call it “corn starch” instead of cornflour. Oh yes, I have seen that in recipes and assumed it is the same thing. Thanks! This looks really delicious! Perfect with some fresh whipped cream! Or vanilla ice cream, or creme fraiche…. 😉 Thanks for stopping by Jill! I know this one! 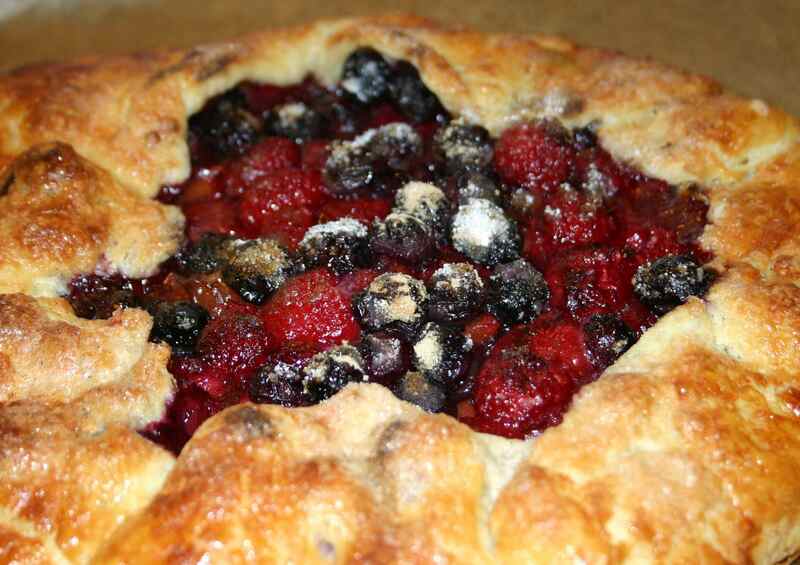 But I know it as “crostata.” In the U.S., we have a whole ‘nother look for “pie.” 😉 This is a wonderful recipe, Cathy, and I love your combination of fruits. Hi Robin. I’ve heard of crostata and galette too, and I suppose they are all basically the same thing… all scrummy! The fruits go very well together, but it’s the buttery pastry that makes it! Doesn’t that look good? I might just have to make one of those. If you DO make one you will definitely not regret it! 😀 Have fun baking! 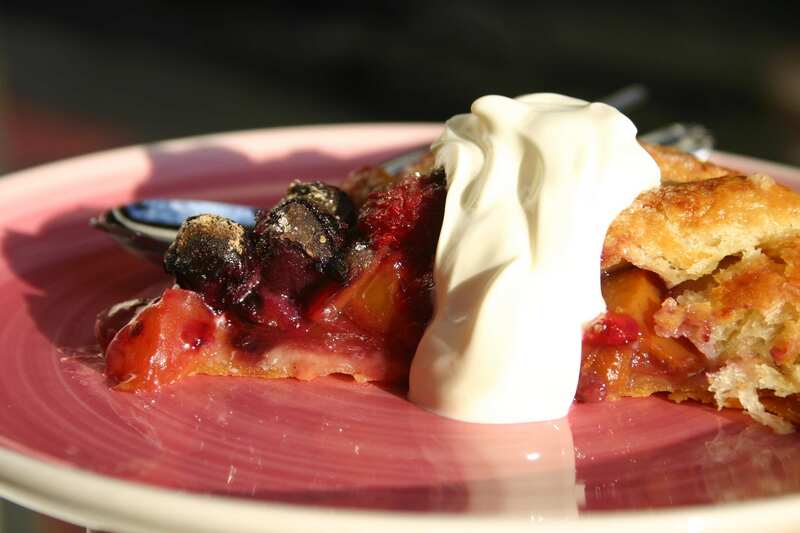 Cathy, your “Country Fruit Pie” really looks beautiful and delicious. Thanks for the recipe! I love making pies but never made one without a pie dish like this…love the look and will give it a try…yum! Looks absolutely delicious Cathy, and a lovely summery collection of fruit. I may well try your recipe later today! Weigh in was Tuesday and I did not loose another 3 lbs. Then I came home to pout and had breakfast yesterday with some woman I know and had 1 too many eggs but fun now this post 🙂 I will gain 5 just looking at it 🙂 I must heal this body so I can run and then be able to try all these yummy goodies you share with us. The Cooking Light magazine used to feature pies like that. I have rhubarb ready to pick in the garden. Maybe I will make one. Yours looks yummy! Why is it I always read your blog with a cup of coffee? Your recipes would go so well on a dish, right next to me… looks delicious with yummy berries and nectarines! Very yummy looking…I have been meaning to try a free-form rustic tart type of thing but I lack courage in baking. I am an ugly baker. You are an inspiration and when it cools down around here perhaps I will try some baking. You come up with the best combinations. Are you are super taster by the way?…it would seem that you would be. That looks incredible, I am determined to master pastry, will give this a try! It’s easy – just keep everything nice and cold and it can’t go wrong! 😀 Have fun!